A plate of vegetable lasagna. The hearty Italian layered casserole of pasta, cheese, vegetables and sauce known as lasagna can be a one-dish meal by itself. If you do choose to round things out with a couple of extra dishes, keep the accompaniments light and simple. Let the lasagna remain the centerpiece of the meal. Vegetarian lasagna can take a long time to cook in the oven, and if you're serving guests, you might find them becoming restless. This is a good time to have some simple appetizers on hand. Try crostini topped with white bean spread and sauteed greens or else marinated cherry tomatoes or mushrooms. Or keep things even simpler and serve a selection of olives and spiced nuts. 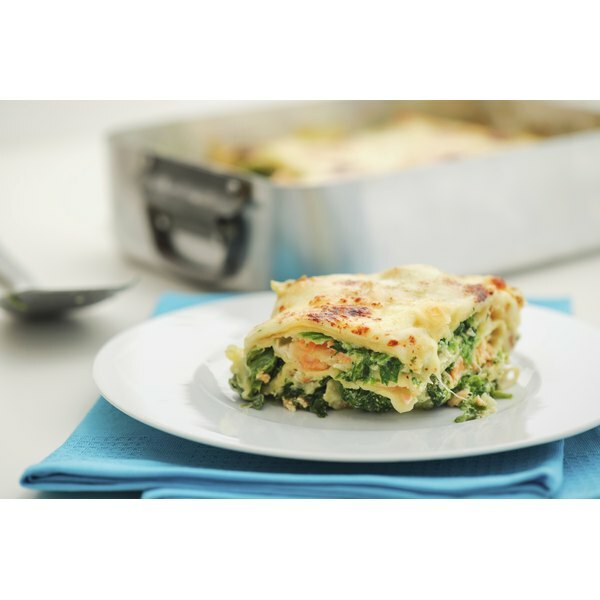 A fresh salad provides a good contrast to a vegetarian lasagna entree in terms of flavors and textures. In many cases, this may be the only accompaniment you need to complete the meal. If your lasagna uses a tomato sauce base, a leafy green salad is a solid choice. Dress fresh lettuces with a simple vinaigrette and add one or two vegetables such as carrots, cucumbers or, for a twist, slivered fennel. An arugula salad dressed with lemon is a sophisticated alternative; top with shavings of parmesan. If your lasagna is made with a white sauce, you can pair it with a fresh tomato salad for contrast. If you prefer a cooked side dish, try sauteed greens. This choice works best if there isn't already spinach or some other green included in the lasagna itself. Broccoli sauteed until its bright green and tender and seasoned with some lemon juice and red pepper flakes is another alternative. You can also roast a head of garlic and serve it on the side accompanied by bread. The obvious choice with which to sop up the sauce from your lasagna is homemade garlic bread. Combine three or four crushed or minced cloves of garlic with about half a cup of butter. Spread this on an Italian loaf split lengthwise. Wrap the loaf in foil and bake in a 350-degree oven until warm. You can also opt for breadsticks--purchased, unless you're a dedicated breadmaker. After such a cheese-heavy main course, your dessert selection should be light on the dairy lest you overwhelm the palate. Try a fruit sorbet with a nice tart edge to balance out the sweetness. Or for something both delectable and healthy, finish the meal with wedges of melon drizzled with Grand Marnier, Pernod, cassis or other fruit-flavored liqueur.